Summer means great weather for mining here at Randall Glen, and here on our mountain at 3100 feet it’s always nice and cool. It feels wonderful to put your hands in the cold water of the flume, and the little waterfalls in the creek make music for your mining. The wildflowers are in full bloom and the baby goats will keep you company. 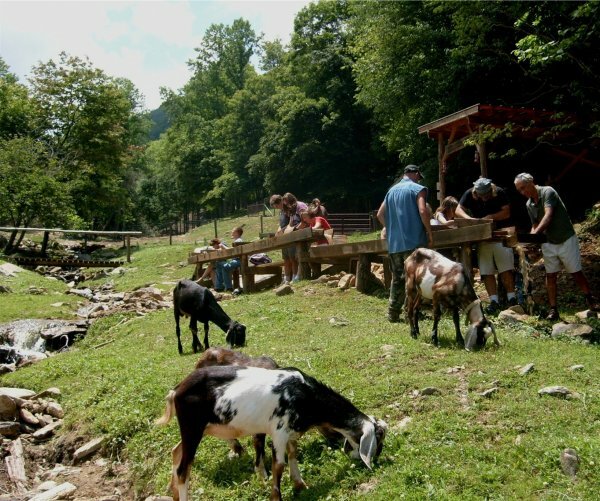 And this is the perfect time for a gem mining vacation at Randall Glen. Come stay with us in our luxury mountainside cabins and mine to your heart’s content! Our cabins are amazing, and there’s so much to do here at Randall Glen—horseback riding, our interactive farm, the Games Barn with ping pong, billiards, Foosball, and air hockey, hiking, fishing, bonfires, barbecue, and much more. You’ll never want to leave! To get all the details about our cabins, visit our Luxury Cabin Rentals page (click on the header at the top of this page) or call us at 828-683-5758.